On April 1, 2002, a National Fire Protection Association (NFPA) safety code went into effect that prohibits the refilling of propane tanks that are not equipped with overfill protection devices (OPD). This code applies to propane tanks with capacities between 4 and 40 pounds, including the 20-pound tanks used by millions of households for barbecue grills. While tanks manufactured after September 30, 1998, are equipped with the required OPD, it is estimated that there are 40 million 20-pound propane tanks that do not have OPD's and must be retrofitted or become obsolete. While this new fire code addresses safety concerns related to the overfilling of propane tanks, the issue of safe and environmentally responsible management of the obsolete propane tanks has not been addressed. In the absence of a national effort to collect these obsolete tanks, they will continue to be a consumer safety concern, particularly if stored improperly. Tanks containing fuel under pressure may explode if tank integrity is altered, causing severe injury or death. The tanks present a very serious threat to the dozen or so waste combustion facilities nationwide that use a shredding mechanism to prepare waste for combustion. If the tanks are discarded along with household trash, there is the risk of explosion or fire during collection. DO NOT ATTEMPT TO REMOVE VALVE FROM TANK. Special safety equipment is required to prevent explosion. Tanks in good condition with old fittings may be reused with adapter purchased at most propane gas dealers. Do not leave valve open, because escaping gas is a fire hazard. Do NOT dispose of tanks containing gas in the trash. Check Yellow Page listings under "Gas - Propane" for company who will take tank for reuse or use the listings on this page. Scrap metal yards may take empty tanks. Consult the local phone directory. Why are we seeing so many tanks lately? Gas grill sales are at an all time high  surpassing charcoal, electric and natural gas combined. LP tanks are stamped with a manufacture date that indicates the start of its 12-year life span. Many tanks are simply running out of date. Other tanks have valves that no longer fit on newer grills. In addition, new federal requirements (effective April 1, 2002) prohibit tanks without an overfill prevention device (OPD) from being filled. You can expect to see a dramatic increase of tanks at that time. Why can't we just throw LP tanks away? All previously used propane tanks have some amount of gas left in them. Because propane is a hazardous material, it needs to be handled or disposed of properly. Is there some reason why we can't just give it to the scrap metal guy? Scrap metal dealers have the same issues and problems, but also are faced with very high explosion risk and damage costs should one of these tanks get into their system. What if we take the valves out? Removal of valves involves costly equipment and extensive training to meet the requirements set out in NFPA 58 1-5 (Qualifications of Personnel) and 4-2.2.1 (Emergency Response Procedures). In addition, most scrap metal dealers are not satisfied just having the valves removed; and prefer tanks to have more than one opening or be cut in half to ensure complete gas expulsion. Are there any special precautions to heed when handling or storing tanks? So long as the tanks are separate from other collected items there are no special needs. It's probably a good idea to maintain a no smoking zone throughout your facility. Should we accept only empty tanks or open the valves ourselves? All previously used LP tanks have some propane in them at all times. Accepting only empty tanks encourages people to improperly dispose of their tank(s) or release unacceptable amounts of propane into the atmosphere. NFPA 58 4-3.1 states "LP gas shall NOT be vented to the atmosphere" except in an emergency situation. Does it matter how we stack the tanks? Absolutely. Propane tanks should always be stored in an upright position. Never store tanks on their side or upside down. NFPA 58 5-21.2. Do the tanks need to be plugged? Old style valves with internal threads only should be sealed with a plug. NFPA 58 4-2.2.3. Would a local propane filler be interested in these tanks? Many local propane fillers have little or no interest in these tanks. Many times, the reason an individual is disposing of their tank is because it's out of date or no longer fits their grill. Out-of-date tanks must be recertified by qualified individuals and require special training and equipment to do so. In addition, many local fill stations lack the space to store a number of tanks and may face disposal fees or charges. What about the bigger propane companies? Any interest there? A lot of the bigger propane companies are concerned and willing to work with this problem even though they have no real use or need for them. Chances are good that, if you do find a propane company that is willing to accept LP tanks, you will more than likely have to transport the tanks to their facility. Eastern Propane (973-697-3111) will accept used propane tanks of any size delivered to their Oak Ridge (Jefferson) location for $12/tank. What's the best way to transport LP tanks to locations that are willing to accept them? First of all, you'll need to determine how many tanks you'll be transporting. The most you can carry without special licensing or placarding of your vehicle is 25 standard grill tanks. NFPA 58 6-2.2.8 states that vehicles transporting more than 1,000 lbs. of LP-Gas, including the weight of the cylinders, shall be placarded as required by DOT regulations or state law. Can I just throw them in the back of my pickup truck? You must secure tanks on a flat surface or in racks, and in an upright position in such a way as to minimize movement to each other or the vehicle. Cylinders shall be determined to be leak free before loading into vehicle. NFPA 58 6-2.2.6. Some municipal recycling facilities accept BBQ-sized propane cylinders for recycling. Contact your municipality first before delivering a tank to a recycling depot. 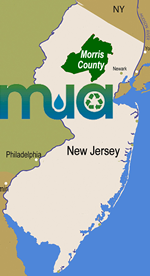 Listed below are collection sites (alphabetically, by town) located within or adjacent to Morris County, NJ that accept BBQ-sized propane cylinders for recycling, re-fill or upgrade. Some of this information was obtained from the Blue Rhino Web site and from Tank Recyclers. Note, please verify pricing and availability of drop-off service before delivering propane to any of these programs. Park Union Building Supplies, Inc.